Few Christians, if any, move into to a new town and just decide to join the church that meets closest to their house, like the church around the corner. There’s a lot that goes into deciding what church we’ll join. We want to know what the church believes, what their mission is, what sort of values do they embody, if there are any major troubling issues, if this is the sort of community we want are children to be a part of, and on and on go the number of questions we want to know. That’s all fine. I get it because I have those questions too. In fact, those are some of the questions I ask of churches seeking a new minister to serve with. However, somewhere in time, we started concerning ourselves with other questions too that have to do usually with just a couple hours on Sunday… worship and preaching. We know the concerns in the way people judge evaluate whatever church they just visited… One person wants contemporary worship, while the other prefers the liturgy. Someone else can’t stand all those old hymns, while another person thinks the contemporary praise choruses are just a bit too shallow for their liking. Then comes the preaching issues… the sermon is too long, too short, lacking humor, not serious enough, too theological, too shallow, and on and on it goes. Somewhere in time our worship preferences became the standard by which we decided whether we liked a church or not, whether we would join that church or not. Somewhere in time the consumerism of American culture became a value among Christians and we started shopping for churches like we shop for everything else. Don’t believe me? Go visit any bookstore and look at the Bible section. Besides having to decide which English translation we prefer reading from, we now have specialty Bible’s marketed to almost every niche imaginable all to satisfy our consumeristic value. Back to worship and church. 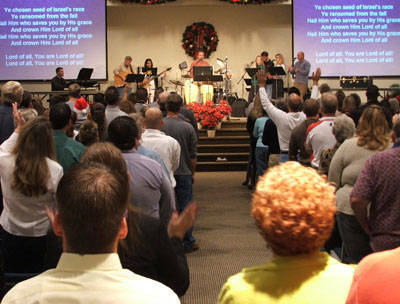 We evaluate worship and the church based upon our consumer driven desires. Are we getting fed? Does the service inspire us? Are we happy? Somehow, church and worship became about us? But here’s the problem: When church and worship becomes about us, we develop an appetite that will never be satisfied! It becomes like an addiction and we need that bigger emotional high or that next powerful sermon to get our fix. The only problem is that as time goes by, it gets harder and harder to keep getting our fix. That’s usually when we bolt for another church because the church we’re at doesn’t get us high enough anymore. If we’re lucky enough, perhaps we can find a good sermon podcast or catch some cool church streaming their worship live but eventually that well runs dry too. Before we know it, our faith has become dependent upon the church and its Sunday worship gathering. When the can’t deliver the goods, our faith begins to sail like a lead balloon. Eventually we come to the point where there isn’t any church with enough juice to fill up our faith and so we are left with a dead faith. But it doesn’t have to be this way. It shouldn’t. It never was meant to be this way either. There are numerous passages throughout scripture that suggest we have a part in maintaining our faith that we must take responsibility for. This isn’t to suggest that we earn our salvation, that we make up our own faith, or that our faith is dependent upon us. It’s like food and eating. We’re dependent upon God for blessing the tree with fruit but if we’re going to reap the blessing of that fruit, then we need to go pick some fruit off the tree and eat it. If we can’t do that, then hunger is what we get. The best way for us to take responsibility for our own faith is to devote ourselves daily to the scriptures and to prayer. Such discipline is not always easy to maintain because there is so much in life competing for our time and attention these days. There are numerous daily Bible reading plans available on the internet. Some are free and some will cost a few dollars but as long as we can afford five dollar coffee drinks at Starbucks, we can afford to spend a few dollars on a Bible reading plan. So Pick one! After your reading spend a few minutes praying about it. Pick a couple of other times slots throughout the day for prayer and do that every day so that you can develop a rhythm. By taking responsibility for our own faith through daily attention to scripture and prayer, not only will we discover our own faith coming alive but our experience during worship will change for the better too. Whether we’re in a high church, low church, traditional church, or contemporary church, we’ll come full of the Spirit. We may come with great joy or great sadness on our hearts, depending on what is happening in our own lives, but we’ll come with a genuinly Spirit-filled faith in Jesus Christ ready to truly worship God with our church. This entry was posted in Church, Contemporary Christianity, Discipleship, Faith, Suffering, Worship. Bookmark the permalink. Another speaker reminded us that worship is always all about God – not us! Yes, we are blessed by worship, because glorifying God is what we are made for, but when we let our consumer mentality creep onto our worship, we are taking the focus off of our Holy Creator, and buying into the prevalent lie that it’s all about me. Anorexic Christians… that will preach!